N00b Squad - "A tale of two cameras"
After I read about the DSi, I thought that at this point, wouldn't Apple be pissed? 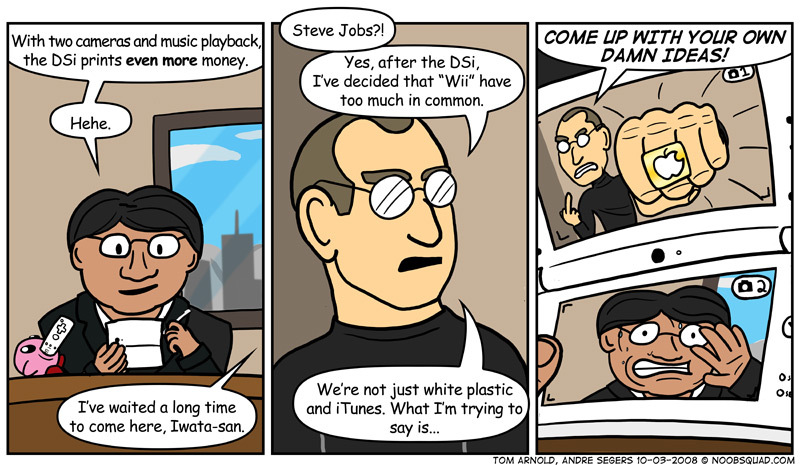 Wouldn't Steve Jobs just want to punch someone from Nintendo in the face for copying them? Then Andre suggested the revolutionary DSi could capture both moments at once. And also, maybe that's why Apple put games on the iPhone. Unfortunately, the DSi doesn't appear to be any more powerful than the DS BUT it does have an SD card slot for downloading games. If the DSi can have downloadable games that are more stylish and inspired than their retail buddies, then I'm all for it. I know lately all I've been playing are downloaded "arcade" games such as Mega Man 9. And perhaps the most important Nintendo news this decade: They are making Wii Punch-Out to be released in 2009. The game is being handled by Next Level Games, the same guys that made Mario Strikers. So far, it looks promising.